$1 million doesn't go as far as it used to, especially with interest rates so low. Using solid dividend-growth stocks is a sound strategy in the wake of ultra-low interest rates. We analyze the probability of running out of money in retirement using different strategies. I remember a time when having $1 million when you retire means you made it. You really made it. In 1995 you could have plunked down the entire $1 million into 10 year treasuries and lived on 8% yields. Compare that to the paltry 1.6% yield today. For comparison sake, I wanted to see what $1 million could get a couple if they retired at age 65 in the year 1995. If they put every penny into 10 year treasury bonds, how much money could they spend each year? 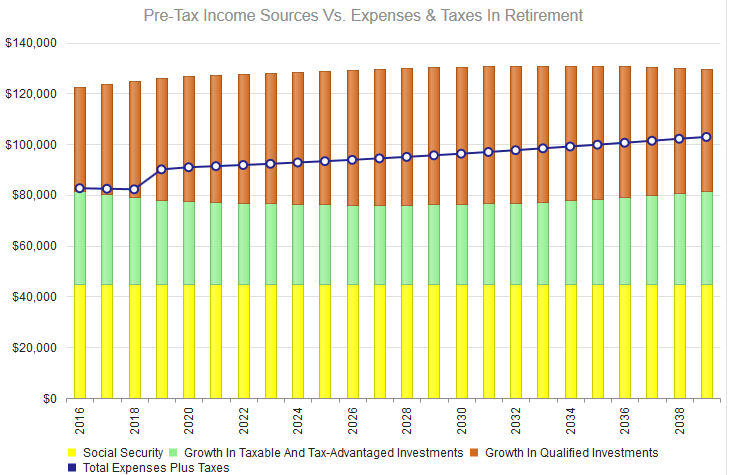 I analyzed this situation in our WealthTrace Personal Financial Planner, which is available to the public as well. For this exercise I assumed 3% inflation, $45,000 in combined social security, and a life expectancy of 90 for both people. I also assumed that half of their money is taxable and half is in an IRA. What I found is astonishing compared to today's financial plans. I found that this couple could spend $75,000 per year in retirement and still have over $1 million dollars (inflation-adjusted, real dollars) when they both hit their life expectancy. You can see below that their income in retirement easily covers all expenses and taxes in every year. I also found that their probability of never running out of money, using our Monte Carlo analysis, is 100%! I honestly never see a 100% probability with financial plans today. Why? Because nobody invests solely in treasuries. They can't because interest rates are just too low. Looking at this another way, if this couple retired earlier at age 57, they would still have an 80% chance of never running out of money in retirement. Now What Does $1 Million Get You? Oh, those were the days. Today most of us are banging our heads against the wall trying to navigate ultra-low interest rates and a stock market that appears to be propped up by these same low interest rates. If this same couple took their $1 million today and invested all of it in 10 year treasury bonds, their probability of never running out of money plummets to only 60%. Even with $1 million saved, this couple is in trouble if they cannot find alternative investments to treasury bonds. My solution to today's dilemma when it comes to investing for retirement is to look very closely at dividend-growth stocks. But not just any dividend payer with a high dividend yield. What we are after for the long run is dividend payers who have a long history of increasing their dividends, even in recessions. My favorite way to reduce volatility while maintaining reasonable levels of return is to buy high quality dividend paying stocks that have a history of rising dividends over time. A few of my favorite dividend payers for retirement portfolios that have consistently raised their dividends over the years are Johnson & Johnson (NYSE:JNJ), Procter & Gamble (NYSE:PG), Wal-Mart (NYSE:WMT), Coca-Cola (NYSE:KO), and Exxon (NYSE:XOM). I took 75% of this couple's savings and placed it into a basket of dividend-growth stocks with characteristics that mimic the above companies. I left the remaining 25% in 10 year treasury bonds. I re-ran their plan and found that their probability of never running out of money jumps to 75%. Having only a 3 out of 4 chance of never running out of money in retirement is disconcerting to many people, and it should be. But this is the financial world we now live in with interest rates being so low and many being forced to put more money into the stock market than they would like. So how can we boost this couple's chances? One way is for them to cut spending. I have recently written about planning for different budgets in retirement. If they decrease their spending in retirement by $5,000 per year, their probability of not running out of money increases to 84%. If they instead retire two years later (at age 67) their probability jumps to 83%. We live in trying times when it comes to investing for retirement. But that doesn't mean you should give up and work the rest of your life. By choosing solid dividend-growth stocks with a rich history of increasing their dividends, you can still retire relatively stress-free with dividends generating the income you need to live off of. Disclosure: I am/we are long JNJ, XOM. I wrote this article myself, and it expresses my own opinions. I am not receiving compensation for it (other than from Seeking Alpha). I have no business relationship with any company whose stock is mentioned in this article.